A manufacturer makes wooden circles out of square blocks of wood. If the wood costs $0.20 per square inch, what is the minimum waste cost possible for cutting a circle with a radius of 25 in.? 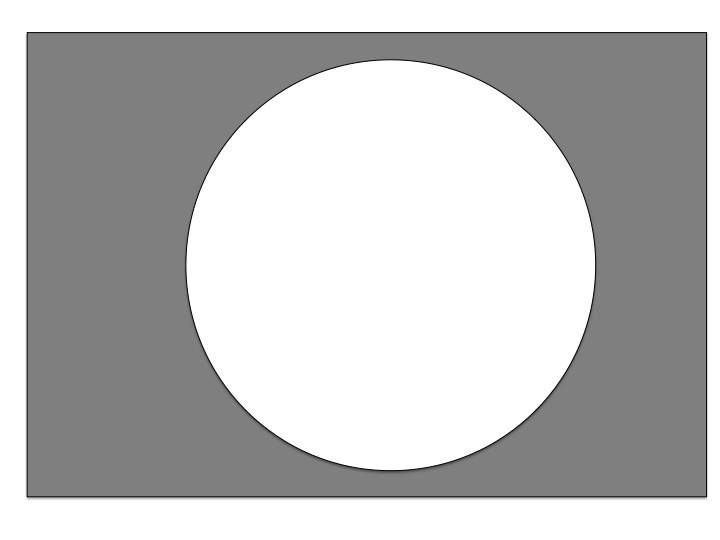 The smallest block from which a circle could be made would be a square that perfectly matches the diameter of the given circle. (This is presuming we have perfectly calibrated equipment.) Such a square would have dimensions equal to the diameter of the circle, meaning it would have sides of 50 inches for our problem. Its total area would be 50 * 50 or 2500 in2. 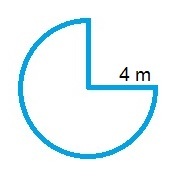 Now, the waste amount would be the "corners" remaining after the circle was cut. The area of the circle is πr2 or π * 252 = 625π in2. Therefore, the area remaining would be 2500 - 625π. The cost of the waste would be 0.2 * (2500 – 625π). This is not an option for our answers, so let us simplify a bit. We can factor out a common 5 from our subtraction. This would give us: 0.2 * 5 * (500 – 125π). Since 0.2 is equal to 1/5, 0.2 * 625 = 125. Therefore, our final answer is: 500 – 125π dollars. A circle with diameter of length is inscribed in a square. Which of the following is equivalent to the area inside of the square, but outside of the circle? We will now substitute this into the formula for the area of the circle. We next will need to find the area of the square. Because the circle is inscribed in the square, the diameter of the circle is equal to the length of the circle's side. In other words, the square has side lengths equal to d. The area of any square is equal to the square of its side length. Therefore, the area of the square is . Lastly, we will subtract the area of the circle from the area of the square. We will rewrite so that its denominator is 4. An original circle has an area of . If the radius is increased by a factor of 3, what is the ratio of the new area to the old area? The formula for the area of a circle is . If we increase by a factor of 3, we will increase the area by a factor of 9. A square has an area of . If the side of the the square is the same as the diameter of a circle, what is the area of the circle? The area of a square is given by so we know that the side of the square is 6 in. If a circle has a diameter of 6 in, then the radius is 3 in. So the area of the circle is or . Mary has a decorative plate with a diameter of ten inches. She places the plate on a rectangular placemat with a length of 18 inches and a width of 12 inches. How much of the placemat is visible? The nearest integer is 27. Allen was running around the park when he lost his keys. He was running around aimlessly for the past 30 minutes. When he checked 10 minutes ago, he still had his keys. Allen guesses that he has been running at about 3m/s. If Allen can check 1 square kilometer per hour, what is the longest it will take him to find his keys? Our answer, however, is asked for in kilometers. 1800m=1.8km, so our actual area will be square kilometers. Since he can search 1 per hour, it will take him at most 10.2 hours to find his keys. A 12x16 rectangle is inscribed in a circle. What is the area of the circle? Explanation: Visualizing the rectangle inside the circle (corners touching the circumference of the circle and the center of the rectangle is the center of the circle) you will see that the rectangle can be divided into 8 congruent right triangles, with the hypotenuse as the radius of the circle. Calculating the radius you divide each side of the rectangle by two for the sides of each right triangle (giving 6 and 8). The hypotenuse (by pythagorean theorem or just knowing right triangle sets) the hypotenuse is give as 10. Area of a circle is given by πr2. 102 is 100, so 100π is the area. What is the area of the following figure? The radius is meters.